Overview: Ilium (perhaps better known as Troy) was also excavated in the 1870s; in this game your teams of archeologists collect various artifacts, seeking to build the most complete collections of objects. Rating: Pretty good, but can feel like a mathematical puzzle. Who Will Like It? If you’ve played many of Reiner Knizia’s games, you’ll know that many of them can be somewhat abstract and are based on some underlying mathematical principles. Some people like that, and some people are turned off by it. Oh, those wacky historians, demanding artifacts. Ilium does involve digging up treasures, but it may be tricky to see the connection between what you’re doing and what it has to do with archeology. The board consists of various dig sites of varying sizes with stone paths connecting them. The artifacts are groups of coins, horses, armbands, bottles, and helmets, and players collect them by filling up the paths between dig sites. It’s hard to see exactly how the mechanic of placing people on a path translates into digging up artifacts, so the theme is a bit abstracted. One interesting thematic element, though, is that each player has a historian card which shows one type of artifact. At the end of the game, before scoring, the player must “donate” their highest-valued token of that type to their historian. Ilium archeologist assignment cards: 1, 2, 3. The components are simple but nice. The archeologist meeples are kind of tiny, which is nice because there are so many of them. The board is well-designed mechanically, but I think they went a little too far in trying to make it look realistic. For the game, it’s important to know exactly how many steps each stone path has, but because everything is brown and grey, it can be difficult to see the paths clearly. One BoardGameGeek user suggested outlining all of the stones with a Sharpie, which would make it less attractive but certainly easier to read the board. For setup, the artifact tokens are shuffled, and then placed on the dig sites face up. Each dig site has a numeral in the corner showing how many tokens it holds. Once the tokens are placed, they should then be arranged in value from lowest to highest to make them easier to spot. For the two-player game, a specific number of tokens is removed, and the three dig sites on the left side of the board are covered with the Closed tokens and are not used. Also, depending on the number of players, some assignment cards are removed from play. Each player gets their archeologist figures, their deck of assignment cards, and supplies cubes. Also, the historian cards are shuffled and one is dealt face-down to each player. Players may look at their own historian card but do not share these with other players. On each turn, the player flips over their top assignment card, which indicates how many archeologists they will place this turn. They take the designated number of archeologists and place all of them on a single unoccupied stone on any path. They may also choose to use one or more supplies cubes on the same path, if there is still room after placing archeologists. When a stone pathway between two dig sites is filled with figures and cubes, an excavation occurs. The player with the most figures on the path chooses from either site, and takes the token with the lowest value. If the player with the second-most figures has at least half as many figures as the player with the majority, then they get the lowest value token from the other dig site. Otherwise, the player with the majority takes both. The game ends when all of the assignment cards have been used. 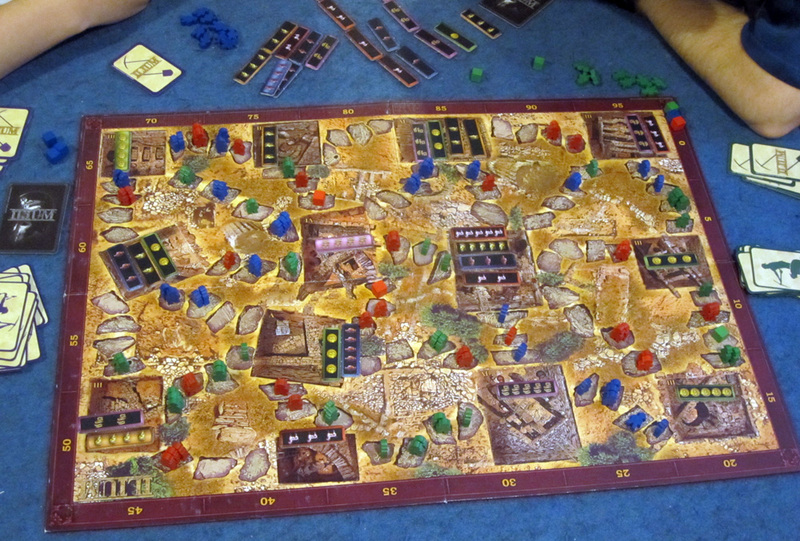 However, if all of the value 4 tokens (with colored backgrounds, as you can see in the photo above) have been excavated, a player may choose to end the game at the end of their turn. First, each player then donates their highest-valued token of the relevant type to their historian, and then scores are calculated. The player with the most artifact tokens of each type scores 10 points, regardless of the individual values of the tokens. If there are ties, tied players each score 5 points (no matter how many players are tied). Then, each player scores 10 points for each complete set of all five types of artifacts. The easiest way to do this is to see which type of artifact you have the least of, and then count those up and give yourself 10 points for each one. Highest score wins; ties are broken by the highest total number of artifacts. Two variants allow for different types of strategy: one allows you to play whichever value assignment card you choose each turn, but you still only play each card once. Another forces you to take the tokens in the order they are arranged, so that if tokens are tied in value you must take the top one first. Ilium can be quite difficult to master. Because of the way artifacts are excavated, you typically want somebody else to finish some paths first to clear out the lower-valued tokens so you can get at the higher ones. But you also don’t want other players to end up with too many tokens, since they’ll get bonus points for that. The balance can be very difficult to achieve. Plus, with so many different paths all over the board, it’s nearly impossible to get in on every path before it gets excavated. And since you have to have at least half the majority to claim anything, sometimes you can devote a lot of archeologists to a path yet still not claim any artifacts when it’s filled. Like I said before, the game is a clever mathematical puzzle. Because the number of tokens in each dig site matches the number of paths leading away from it, you’ll have exactly the right number of people to fill up the paths to dig everything up. Figuring out where to put your people and which paths to dig up first — the bulk of the game — is a real trick, and it takes a combination of luck (in which assignment cards you get), prediction about what the other players may do, and wise placement of your supplies cubes, which can finish off a path so nobody else can play archeologists there and outnumber you. I did like Ilium but felt it was a bit abstract. I felt like we didn’t really get into the theme of digging up treasures. Instead, it felt more like a numbers game, trying to use the fewest number of archeologists required to get the tokens we wanted. If you really want to be able to get into the theme of a game, then Ilium is probably not for you. If you enjoy a good logic puzzle, though, then you might really dig this game. 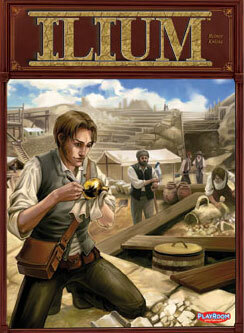 You can pick up Ilium from Amazon or check your local games store. Wired: Clever mechanics force you to anticipate what other players will excavate; archeologist meeples are cute. Tired: Stone paths on board can be hard to see; gameplay is somewhat abstracted from the theme.